Ninja Coffee Bar is very popular and trustable home used coffee brewing system which is manufactured by top leading home appliances brand “Shark Ninja”. 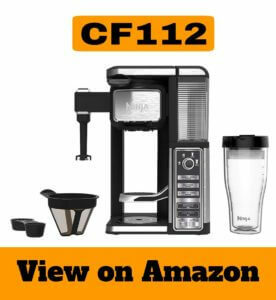 Many user unable to find what are the differences between these model, Ninja Coffee Bar CF111 and CF112. Let’s compare it. Ninja F111 and CF112 are Single-Serve System which means it brews single cups of coffee (no pods required). Both look exactly same, it’s hard to find differences between these. Not only look almost all features are exactly same. Comes with filter so you need not to spent extra money to purchase additional filter. As i have already told you it’s exactly in everything but there is only small different in these model which is : A Tumbler. Model CF112 comes with a Ninja XL Thermal 22 oz. Multi-Serve Travel Mug which can hold handle hot and cold drink. But CF111 doesn’t have any tumbler. It takes 2-3 mins to brew where as Keurig coffee makers are little faster than this. Ninja Coffee Bar CF111 and CF112 both are very good coffee maker and packed truck loaded features. Some people can turned off by plastic construction but overall built quality is very good. In both model there is no difference except one which is a tumbler. If you will choose any you’ll never regret on your buying decision. Both are awesome, and totally value for money product.